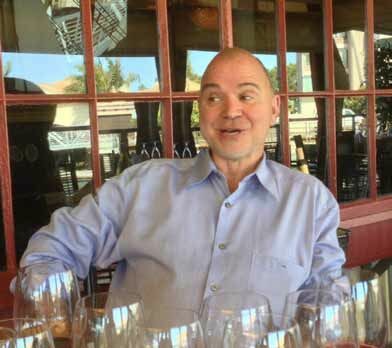 Claude Koeberle and Don Plumley couldn’t have more dissimilar backgrounds, yet their fortuitous meeting led to a subsequent winery partnership that in less than ten years has become one of California’s most avant-garde wineries. It wasn’t wine that brought them together, but rather two dogs, Chip and Gabby (more about that later). Claude hails from Burgundy where he was born into a family whose tradition in the wine industry dates back decades. The family both owned vineyards and made wine. As a youngster, Claude hung out with many of Burgundy’s greatest vignerons including Henri Jayer, who joined the family table at Claude’s home. Although he achieved remarkable success as a chef, he never lost his passion for wine, and Pinot Noir in particular. Don did not have the good fortune to grow up in a family with wine on the dinner table. The idea of a career in the wine industry was never on his radar as he successfully pursued a career in sales and marketing, strategy consulting, and the language translation industry. His first memorable wine, a Chablis, was savored as an adult while in Nice on a sunny afternoon overlooking the Mediterranean. It was Chapel who was to inspire Claude in his future endeavors, encourage his drive for perfection, as well as mold his madness when he told him, “Everyone remembers the best and the worst, but nobody remembers mediocrity.” Claude was to use this inspiration to become the youngest 3-star Michelin Chef in Paris at La Vivarois. A love affair led Claude to New York City where he was a catering chef for many of the city’s important people. He was then drawn to Southern California where he cooked at Ma Maison, L’Orangerie, Les Anges, Tamayo, Opera and Tapenade. A James Beard Award winner as a Master Chef, Claude is currently a partner in several restaurants including Bouchon and San Francisco’s Frances. Along with his chef spouse, Elisabeth, he is the driving force behind Creative Culinary Concepts, Inc. and K World Cuisine, Inc., both based in Newport Beach, California. Don was born and raised in Southern California to a Japanese mother and American father. He was a high achiever, the third youngest in the nation to obtain the Eagle Scout level, and was accepted to medical school after an undergraduate degree at University of California at Davis (he deferred his acceptance and ultimately never attended medical school). He married his college sweetheart, Beth, had a son and daughter, and later graduated with an MBA from UCLA with an eye to international business. A global job for a language translation company led to constant overseas travel and many business meals at great restaurants where he learned to navigate wine lists. While living in Irvine, California, Don was to meet Claude through a stroke of luck because of the family dog, Chip. Chip became friends with a neighbor dog named Gabby, who happened to be leashed to Elisabeth Koeberle, a neighbor in Irvine. Beth and Elisabeth became friends, and so the Plumleys did what they always did for new friends, they invited them to their house for dinner. They had no clue as to their cooking credentials. What they cooked or even drank is a distant memory, but the Koeberles reciprocated and Don realized the Koeberles were in a different food orbit. The friendship was cemented one evening when Don cooked his “famous” fire pit paella and Claude was weeping in his dish. Don was mortified and thought, “What have I done?” Claude said, “It is sooooo good.” A lifelong friendship bound by food was born. Claude began to share his extensive wine cellar with Don and showed him a side of the wine list he had never experienced. Don fell deeply in love with Burgundy, and Claude was a willing enabler. Don had an opportunity to direct a manufacturing company in Petaluma and this tore the Plumleys away from their dear friends Claude and Elisabeth. It was then that another stroke of fate enabled Soliste. The Plumleys settled in Petaluma near Beth’s sister and spouse who had become serious wine fans and established Sonatera Vineyard near Sebastopol in the Sonoma Coast appellation. 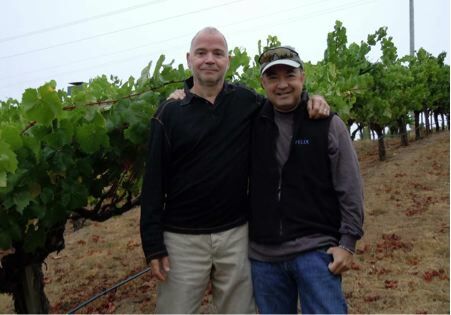 In 2005, during a break in careers, Don took a bottle of wine made from Sonatera Vineyard fruit to Claude and they shared the bottle in Claude’s backyard. Claude sipped and remarked, “It’s not my style, but there’s some pretty interesting stuff in there.” Don replied, “There’s a block available, we can make it our way. 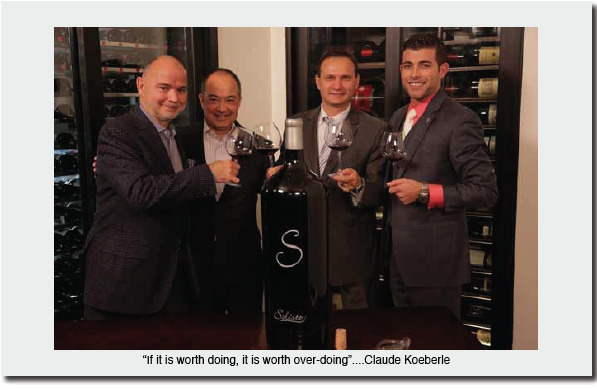 You are always complaining about California wine, so here is a chance to do what you want.” Claude had never considered owning a winery or making wine, but he quickly agreed to their partnership and that’s how Soliste Cellars was born. The name Soliste is derived from the special barrel or “soliste” that Burgundian winemakers reserve for their family and friends. The first vintage was 2005 and consisted of 130 cases of Sonatera Vineyard Pinot Noir. It was intended primarily for cronies and family, but sommeliers loved it and restaurants snapped it up. The following vintage consisted of 650 cases and was sold primarily to restaurants. Young winemaker Ryan Zapaltas (Zepaltas Wines, Siduri Wines) joined the team with the 2007 vintage and production was slowly increased. The plan was to stay small, focus on selected restaurants with the promise that the restaurant clients would never run out of wine. The project was costly but only tenable because the partners retained their professional jobs. Because it was two dogs who brought Claude and Don together and led to the founding of Soliste, the corks from Soliste wines display two paws, one on each end. The goals at Soliste soon became clearly defined and characterized by focus and conviction. There would be no compromise in quality with all farming and winemaking decisions based on what went into the bottle rather than financial considerations. Claude says, “We thought that if we did everything right there was not much financial risk.” The word commitment comes up frequently in conversations with Claude. He professes a dedication to Old World beliefs and traditions, applying them to produce California wines that not only have finesse and balance that work in harmony with fine cuisine, but can compete with the best on the world stage. Claude is a staunch believer that Sonoma County has the finest fruit in the world, but it is often abused in the sense that it is picked too ripe and vinified with too much extraction and oak, resulting in wines that are monotone in character and lacking in identity. This fanatical commitment to quality reaches its ultimate expression in the MonoClone® Pinot Noir program launched with the 2009 vintage. The belief at Soliste was that blending clones, different vineyards, and various cooperages homogenized the aromas and flavors of Pinot Noir. Instead, all Soliste Pinot Noirs consist of a single clone, married with a specific site, climate and exposure, and then aged individually in a single cooperage. Claude remarks, “We believe that a wine from a single clone from a single site is the most expressive wine from that site.” For example, the Sonatera Vineyard has three different hillside exposures and several different clones. A blend tends to diminish what each clone brings to the finished vineyard-designated wine. Claude understands that using a single clone implies a higher risk because there is no blending option. Single clone Pinot Noir is often criticized as lacking in some component such that it is not a complete wine. Claude would argue that it boils down to site, particularly with a clone like “828.” The clone must be matched perfectly to site for the purest and fullest expression of a Pinot Noir clone. The use of different coopers also homogenizes a wine by bringing disparate seasoning aromas and flavors to the wine. At Sonatera, the wines will ultimately be aged in new (usually only 20%), 1-year, 2-year, and 3-yearold oak barrels all the same type and specifically tailored for each wine. Such a strict oak regimen is more costly, especially since the preferred barrels are very expensive. Claude’s upbringing and his background as a chef has led him to a unique approach to crafting his wines. His background in Burgundy gives him an understanding of terroir and he appreciates that 90% of the success in making wine is attributable to the work in the vineyard. He is a strong proponent of either owning or directing the farming of his grape sources. His contacts in wine allow him to talk with some of the world’s greatest European winemakers who advise him on a personal and informative level. He has studied barrels in detail, appreciative that wine spends more time in barrel that in the vinification process per se. Claude has done research in both Burgundy and stateside to discover the single best oak barrel most suited to each wine he produces. He also understands that oak is a desirable seasoning for Pinot Noir, but should never be a prominent feature. The analogy in cooking would be adding salt as a seasoning to enhance flavor with the preferable aim that the resulting dish have no detectable salt flavor. Since the first Soliste vintage in 2005, the use of new oak has been reduced by 50%. Claude’s philosophy is well summarized on the Soliste website. “We are particularly inspired by winemakers who have challenged the status quo to elevate their region or cépage to grand cru level. Central to our philosophy is to be bold, experimental, and take risks; not arbitrarily, but with intent, diligence, and a long term vision.” He invokes the rebellious voice of the Master of St. Andelain, the self-taught iconoclast Didier Dagueneau, “If you want to be the best, you need the methods and techniques to get you there. Your vines must bear the best grapes; your vinification must be the most rigorous. There are no recipes. It’s all in the details of viticulture and all the details of winemaking, the assemblage of little things, 100 details and commitments which makes for the minute differences between a good wine and a great one.” Claude is obsessed and infatuated with Burgundies and is not shy when setting expectations that his Pinot Noirs show similarities to the great wines of Burgundy, even the one with the three-letter acronym. The four MonoClone® Pinot Noirs produced since the 2010 vintage are sourced from Sonatera Vineyard, Keller Estate (located in the Petaluma Gap region of the Sonoma Coast), and Guidicci Vineyard (located on Vintner Road near Occidental), all in the Sonoma Coast appellation. The Forêt is 100% Clone 23 (Mariafeld) and the L’Ambroise 100% clone “828” are sourced from the Guidicci Vineyard. The L’Espérance is 100% clone 115 and sourced from Sonatera Vineyard, and the Nouveau Monde is 100%Pommard clone from Keller Estate. It is of interest to discuss each wine individually. L’Ambroisie This wine was first produced from the 2010 vintage. The Guidicci Vineyard is a gorgeous vineyard site situated on a steep slope in the middle of a redwood forest. The “828” clone planted here is neither Dijon 828 nor a true clone but a selection brought to the U.S. from France by Gary Andrus with its true origin still shrouded in mystery. The site is crucial with the “828” selection because wines made from 100% “828” can be spectacular or insignificant. Only 29 cases (1 barrel) was made in 2011. Forêt The reclusive Mariafeld clone, UCD 23, has rarely appeared as a single clone, vineyard-designated offering. This clone was brought into the United States from the government research station in Wädenswil, Switzerland in 1966. Like “828,” it is a very site-specific clone and is more widespread in Oregon than California. Typically, the clone shows brilliant red and black cherry and berry fruit with notable Christmas spice and plenty of backbone. Claude likens this wine to those of Vosne-Romanee. Nouveau Monde This wine marries the virtues of Volnay and Pommard and is likened to a Côte de Beaune classic. It displays the synergy between the fresh crystalline acidity of Volnay and the abundant yet fine tannins of Pommard. 149 cases produced in 2010. L’Espérance For the partners at Soliste, L’Espérance is their benchmark, the wine that sets the tone and embodies all the challenges, determination and sacrifice that comes with crafting compelling Pinot Noir. Very Chambollesque, this wine is always the most sought after Soliste release. Only 49 cases produced in the 2010 vintage. 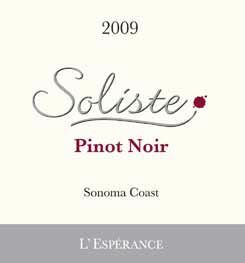 The greatest California Pinot Noir I tasted in 2013 was the 2009 Soliste L’Espérance enjoyed one day at a lunch and generously shared by Claude, now long since sold out (49 cases produced), and only a lasting memory. Other Soliste varietals that I have samples have also been memorable. 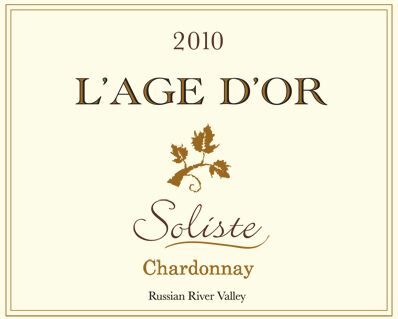 2010 L’Age D’Or Russian River Valley Chardonnay Claude has long refused to acknowledge that California makes Chardonnay and never considered an attempt to produce it. He has said, “They are not wines, they are replacements for cocktails. They are like buttery popcorn soaked in oak trees.” When Don suggested they make Chardonnay, Claude intoned, “Over my dead body.” He felt that if they could not make it lean and elegant with great acidity and balance, they should not even try. He told Don, “Come and try this Montrachet with me and let the urge pass.” Don’s continued pestering eventually led to Claude’s agreement to make Chardonnay with him in the Soliste style. The partners planned a three-year commitment using the Rued selection of Chardonnay from the established Lynmar Quail Ridge Vineyard in the Russian River Valley, and undertook trials with various vinification techniques including the use of imported Nomblot concrete eggs from Burgundy and 600L thick-stave oak barrels from Taransaud. It was an expensive experiment to say the least. The wine aged in concrete was called Les Cailles and it was hoped that it would have more minerality. The other wine was aged in French oak for 16 months and called L’Age D’Or. Today, Les Cailles is closed in and stays in the cellars until it is ready, but there is no guarantee it will ever reach that point or be released. Claude is not a fan of concrete eggs. Claude has a vision for each of his wines using what he considers the French pinnacle of that varietal as a comparison. For Chardonnay the benchmarks are Domaine Francois Raveneau Les Clos Grand Cru Chablis and Francois & Antoine Jobard Meursault 1er Cru Blagny. The Soliste wine has the minerality, elegance and acidity of those white Burgundies, yet the apple tarte tatin, lemon curd and quince flavors that reveal its Russian River Valley DNA. 340 cases were released on allocation ($50). 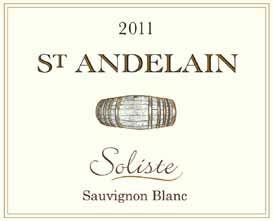 2011 and 2012 Lune et Soleil Lake County Sauvignon Blanc This and the St Andelain Sauvignon Blanc are inspired by the late Didier Dagueneau. Crafted from a single organic estate vineyard using 100% whole cluster pressing and aged in 600 liter barriques of special thick staves to minimize oxygen transfer, malolactic fermentation is avoided to preserve acidity and length. The 2011 (396 cases, $25) is sold out. The 2012 (392 cases, $25) is in limited release. 2010 and 2011 St Andelain Lake County Sauvignon Blanc Didier Dagueneau revolutionized Sauvignon Blanc and brought it to grand cru status equal to that of any great white Burgundy. He was an iconoclast among vignerons with no formal winemaking training, but because he was infatuated with great Burgundies, he brought Burgundian winemaking methods that were uncommonly employed to Pouilly-Fumé. He severely pruned for low yields, hand harvested fruit over several successive passes through his vineyards, used vineyard-designate bottling, skin contact and barrel fermentation. He also created his own barrels, the most famous being a cigar shape barrel that Soliste has adopted to craft St Andelain. This wine is from a single estate organically farmed vineyard. After harvesting, the grapes are de-stemmed, allowed 24 hours of skin contact, barrel fermented and aged 16 months in a cigar shape barrel. There is no malolactic fermentation to preserve acidity and length. 2010 (123 cases, $55) and 2011 (223 cases, $55) are available by allocation. Noted Sommelier, Aldo Sohm, of New York City’s Le Bernardin restaurant said about the 2011 wine: “This is the greatest white wine I have ever tasted, anyplace, anytime.” I have tasted this wine on three occasions and agree wholeheartedly that it is the greatest Sauvignon Blanc short of Dagueneau’s wines I have ever tasted. A true tour de force. 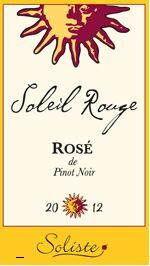 2008-2012 Soleil Sonoma Coast Rouge Rosé de Pinot Noir The first year of this wine, 2008, consisting of 65 cases, sold out immediately. In 2012, production increased to 327 cases ($22) and is in limited release. The Rosé is “Le Vin des Amis,” a fresh, crisp, and aromatic wine that Claude calls a “happy wine that reminds one of summer.” Claude told me the best match for this wine is sushi (“an incredible pairing”), although charcuterie and paella pair beautifully as well. Narcisse Sonoma Coast Pinot Noir You won’t find this wine for sale on the website since the entire production is allocated to restaurants for by-the-glass and bottle programs. It is priced at about half of Soliste’s other Pinot Noirs and is very popular. Made in a more fleshy California style and representing a blend of vineyards, 600 cases were produced in 2012. Claude believes that a winery’s entry offering should not be an afterthought, but be representative of the winery’s vision and quality. For example, many wineries choose their best barrels for reserve and vineyard-designated wine programs by tasting from barrel before bottling. They then blend the wines in stainless steel tanks and bottled them quickly. In the case of Narcisse, the blend spends another 8 months in barrel to allow the blend to integrate and optimize its character before it is released. Winemaking at Soliste is thoughtful and obsessive. Because a vineyard never gives you even ripeness at harvest, and since some whole cluster is preferable in the fermentation, multiple passes are made in the vineyard, an expensive proposition. Claude points out that cold maceration was invented by Henri Jayer because vintages of his time were very cold and a cold soak was necessary to extract concentration and flavor. Applying cold soaks automatically here in California is an anachronism to Claude so he adjusts the use of this winemaking technique to fit the vintage and the site. The very small production Soliste wines are allocated through a mailing list: www.soliste.com. The majority of the wine is sold to fine dining partners throughout the United States ( a list is posted on the winery’s website). 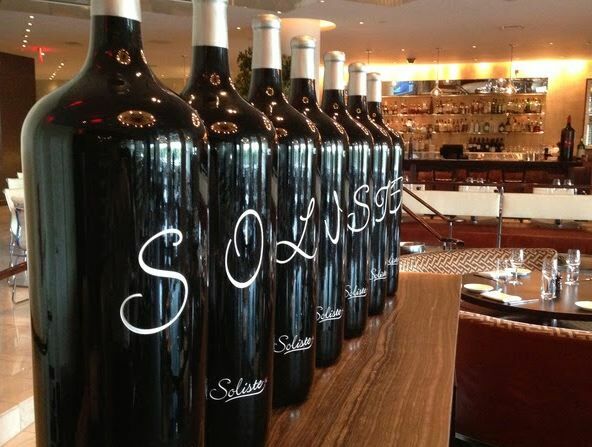 Soliste wines are a favorite among sommeliers and you will find the wines in practically every noteworthy Michelin-recognized restaurant in America. Consumers have come across Soliste wines through word of mouth and fortunately, beginning with the higher yielding 2012 vintage, a little more wine can be allocated to wine lovers. Claude believes the wines will age marvelously, reaching their apogee in 5 to 7 years. The consumer should consider cellaring their purchased wines while drinking the wines at restaurants which are offered at a younger stage. Claude is a big fan of magnums (his grandfather was nicknamed “magnum” because he only drank Krug out of magnums) and a substantial amount of magnums will be available for the first time from the 2012 vintage. Don manages the logistics and sales so he is the one to deal with regarding inquires at don@soliste.com, and Claude is the one to exchange experiences and tasting notes with (he would love to hear from you) at claude@soliste.com. The future is bright for Soliste because the project is a lifetime experiment. Pinot Noir humbles you, and Claude says, “The more you know the less you know.” To further refine and perfect the wines, Soliste continues to search for ideal 8 to 14-acre vineyard sources, preferably estate owned, and thoughts of having a winery where all wines can be vinified using 100% native yeast (Soliste wines are currently produced at a custom crush facility, Vinify, in Santa Rosa where this cannot be accomplished). Staying small, precise and focused to make the best wine from an individual site is the Soliste mantra. I have tasted some of the 2009, and nearly all the 2010, 2011 and 2012 Soliste releases but have only formally reviewed the following. Trust me, all the wines are superb. When you drink Soliste wines with Claude, his charisma leads you on a religious path of devotion to his wines. However, I have experienced enough of the Soliste wines apart from Claude to know that they are really enticing.